Thank you for your interest in the Maryland STEM Career Fair for Girls! This free event is designed to provide high school girls with the opportunity to meet and learn from successful women in a wide variety of STEM careers. This event will also give educators a chance to network and collaborate on future STEM ventures. Ava Marie is the morning meteorologist at WBAL TV. 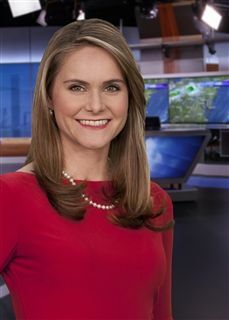 She has been forecasting in Maryland for 7 years, and beforehand, worked as a broadcaster at AccuWeather in State College, Pennsylvania. She earned her Bachelor of Science degree in Atmospheric Science from the University of Kansas. Ava’s love of weather began when she was a little girl growing up in Denver, Colorado, a place known for its extreme snowstorms and thunderstorms. Outside of work, Ava loves playing the role of mom to her two young boys, ages 3 years and 6 months. The Bryn Mawr Melrose Avenue Campus is located at 109 W. Melrose Ave., Baltimore, MD 21210. Take 695 (Beltway) to the Charles Street exit. Drive south on Charles Street past GBMC and Sheppard Pratt hospitals on your left. The first stoplight past Sheppard Pratt is at Bellona Avenue. The next stoplights will be at Stevenson Lane, Gittings Avenue, and Lake Avenue. Two blocks south of Lake Avenue, make a right turn onto Melrose Avenue. The Bryn Mawr School is located on the left at 109 West Melrose Avenue. Take 83 (Jones Falls Expressway) to the Northern Parkway East exit. Take Northern Parkway going east through stoplights at Falls Road and Roland Avenue. Proceed to the stoplight at Charles Street. Turn left at Charles Street, drive three blocks, and turn left onto Melrose Avenue, The Bryn Mawr School is located on the left at 109 West Melrose Avenue. The STEM Fair will be held in the KVB gym. View a map of our campus. Sponsorships for this event are available at several levels. For more information about sponsorships and to sign on as a sponsor, please click here.